LOS ANGELES -- A veteran Culver City police sergeant was killed Wednesday on the eastbound Santa Monica (10) Freeway in the Palms area when his car was struck head-on by a wrong-way driver, who also died in the twisted wreckage, according to the CHP. The collision occurred about 5 a.m. just west of National Boulevard, the California Highway Patrol reported. Culver City Police Chief Don Pedersen said Sgt. Curt Massey, a 17-year veteran of the department, was killed in the collision. "Curt was a very special police sergeant and friend," Pedersen said. "He was kind, thoughtful and always went out of his way to help others. He was a consummate professional. He will be missed by all the members of the Culver City Police Department, and the community today has lost a dedicated police sergeant." 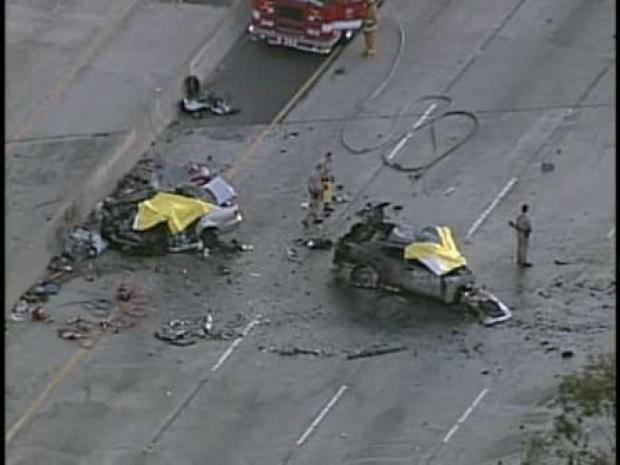 Two people are killed after a driver went the wrong way on the eastbound Santa Monica (10) Freeway. Massey had a wife and three young children, Pedersen said. According to California Highway Patrol Officer Miguel Luevano, Massey was driving east on the 10 Freeway when his 2009 Dodge Charger collided with a 2006 Toyota Camry being driven the wrong way by a 21-year-old Van Nuys man. Massey's car burst into flames. Both drivers died at the scene. The identity of the Camry driver was not immediately released. 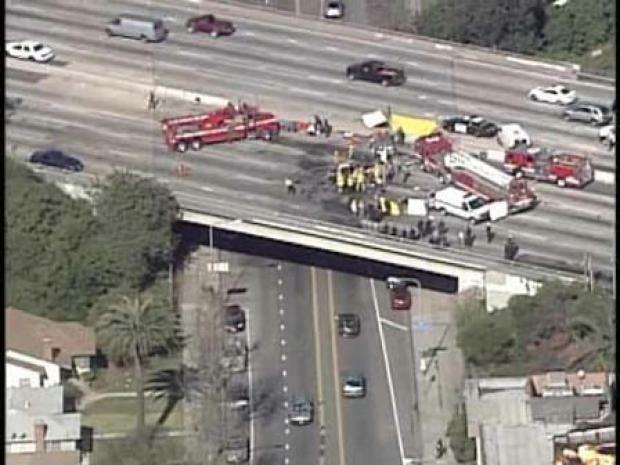 A Culver City police detective was one of two men killed in a wrong-way crash Wednesday morning on the 10 Freeway, according to the CHP. The eastbound freeway was shut down for hours as investigators descended on the scene. Two westbound lanes were also closed. At one point, eastbound traffic was backed up for about four miles, and surface streets throughout West Los Angeles were snarled with motorists trying to find alternative routes during the morning rush hour. The closure extended until shortly after noon, when all lanes were reopened. Police and fire crews on the scene paused and saluted when Massey's flag-draped body was removed from the wreckage and loaded into an ambulance. CHP dispatchers began receiving reports about the wrong-way driver moments before the crash occurred, said CHP Officer Francisco Villalobos. KFWB radio reporter Pete Demetriou told ABC7 that he was driving east on the freeway when he saw a car approaching him, going west in the eastbound lanes. "I cringed," Demetriou said. "I took one look and said, 'Oh, my God. This guy is gonna hit somebody.' Fortunately, I was over two lanes, but even so I'm thinking, it's just a mater of seconds ... maybe a minute or more, he's gonna run into somebody who's coming in the fast lane or coming in lane two." Pedersen said Massey had more than 100 commendation in his file. He had received a medal of valor and was the departments officer of the year three times. "Curt Massey was a 17-year veteran, devoted husband, father and committed public servant," Pedersen said. "Mostly he was a friend and trusted colleague who could always be counted on to be the first one to volunteer for an assignment, to help anyone out or just be there for you as a friend. Curt had a very deep and special interest in working with the youth in this community and outside this community. He was very active in our juvenile diversion program, and he touched the lives of hundreds of young men and women in this city." A fund to assist the Massey family was established at the Culver City Federal Credit Union, 9770 Culver Blvd.